I think I’m a pretty good photo instructor… but don’t take my word for it. Read what your fellow photographers are saying about my workshops and private classes. Scott runs a great workshop! He is personable, knowledgeable, and informative. Out in the field, he takes you to locations where he has shot before. He knows the area and what to look for. He offers composition tips and advice on settings. He will give you as much, or as little, instruction as desired, checking back to make sure you are not having any problems. In the classroom, he tailors the instruction to the needs of the group, answering all questions and showing examples. He works with client images, offers constructive feedback, and explains the steps and techniques that are needed. I highly recommend Scott and I look forward to attending another of his workshops! Just returned from Oregon Coast with Scott Davenport. Trip was wonderful and well thought out. Scott is enthusiastic teacher and helped me with composition, post processing, and better utilization of my camera. He is flexible in meeting desires and needs of the class. Also picked great places to eat and relax. I hope to take future classes with him. If you’re thinking about a photography workshop and need an experienced professional to help you with the details and the photography, look no further than Scott. During my workshop, I referred to him alternately as ‘mother’ and ‘father’. He ‘mothered’ us in every way and gave us ‘fatherly’ advice varying from exposure and shutter speed recommendations to “here’s how to keep your tripod from tipping down the slope, Larry”. I highly recommend Scott if he is doing a workshop in your area, or in an area you’d like to shoot. Thank you for an informative, well organized Photo Workshop. Since this was my first "digital" workshop, I will be holding all others to your high standards. I really liked how your workshop incorporated whatever weather was present, certainly a factor you can't predict or control. Your locations were excellent and there was always something to photograph. We lucked out on the weather in my opinion. Hospitals Reef was my favorite location and we were treated to a beautiful sunset at Sunset Cliffs. I appreciated the small group dynamics allowing one on one time with you. Of particular value to me were the post-processing sessions. Scott is without question the best instructor/tour leader I have ever had! And believe me, I have had quite a few. Besides being an all-around great guy, he is very knowledgeable about all aspects of photography and fully giving of his time. Instead of being off doing his own thing, he is there for us and spends whatever time is required with each photographer asking if any help is needed or if there are any questions. In the classroom, he has a very relaxed and clear style that is easy to understand. I would highly recommend his workshops for all levels of photographers. I've done quite a few workshops over the years, and Scott ranks among the top. He has an easy-going way about him, and translates to incredible attention and focus on students. I've never seen an instructor hustle between students - checking in constantly (even if they are spread out over a large area). What I really appreciated was he never said "this is the picture." It was "There are a lot of options here, and I’ll help you decide what you want to take — not what I think you should take." It was also refreshing to see some tools outside of Lightroom and Photoshop, Scott's direct honesty in what he uses, and what he doesn't, and no pressure to pick a particular style. I'll definitely be working with him again. I very much enjoyed your outstanding workshop. It was a fantastic experience with tons of fun! You present an informative and well thought-out game plan for your workshops. Demonstrated how knowledgeable you are of your photography and post processing skills, along with an enthusiastic willingness to assist you students. I couldn’t have asked for more. I’m thrilled with the knowledge I learned in composition and new ways to post-process my photos. I highly recommend your workshops and hope to participate in another one someday. Thank you for an awesome workshop! I was a little intimidated being the only beginner photographer, but ended up having a great experience and learning so much from you. Thank you for patiently answering all of my questions, walking me step-by-step through your post-processing routine, providing constructive criticism on my photos, and putting me in the best position possible to get good photographs at each location. I feel much better prepared to be able to get 'that shot' when the opportunity presents itself. Thank you again for a great weekend and I hope to join you for another workshop in the future! I recently attended Scott's San Diego Coastlines workshop. It was a well balance weekend with an equal dose of post processing learning coupled with twice daily shooting opportunities. Scott has a keen eye for landscape work both as a photographer and as a post processing teacher. I learned a lot about the ON1 system which was one of my goals for the workshop. We captured some great images even though the weather was far from cooperative. Scott certainly knows the local area and always put us in the right place to 'get the shot'. I found my experience with Scott’s Private Lessons to be very beneficial and enjoyable; live interaction is always best for learning. Scott’s abilities as a professional photographer, positive attitude, and suggestions for creative approaches provided me with new insights for improving my photography. I have since put into practice many of the suggestions we discussed resulting in better feedback from those who view my photographic efforts. I spent the day with Scott in a private workshop. We started before 6:00am and ended after 8:00pm. Scott really delivered a full day of photography. He is a fine photographer, an excellent educator and a fine person that I very much enjoyed being with. Scott has a passion for teaching which he displays in his on-line videos and in his workshops. He is an effective teacher. In our day together, he covered my wish list of techniques: wide angle photography, long exposures, and post processing. I heartily recommend Scott and plan to attend future workshops. Thank you for providing me with an awesome workshop experience. Scott was very sensitive to my skill level and offered sound advice needed to take my photography to the next level. His talents and ability to communicate effectively provided an atmosphere that’s inspiring to learn in. Through his help and guidance, I was able to broaden my knowledge of long exposure and come away with great images. I achieved more than expected…….this was an AMAZING experience and Scott Davenport’s workshops are highly recommended. I joined 4 other photographers for an amazing trip to Death Valley...an opportunity to work with Scott at one of his workshops. I have followed Scott for several years on Youtube and always found his videos on Lightroom, ON1, and landscape photography to be among the best available. His consistent and quality approach to teaching was just what I needed when I rekindled my passion for photography that had laid dormant for several decades. When I signed up for the workshop, my goals were to improve my general landscaping photography skills, to enjoy an amazing treasure like Death Valley and to hopefully meet like minded photographers that were willing to share and help everyone grow. To exceed expectations on all 3 goals, it takes a effective and thoughtful leader...one that has the ability to meet the needs of a diverse group of photographers at various levels but also the skill to ensure the groups achieves the expectations for the workshop. Scott exceeded my expectations on all fronts. He is thoughtful and engaging with great listening skills. He is organize but flexible and responsive. He has the skills to get the group to share and learn from each other. And he maximized our time and opportunities. If you are looking for a wonderful location, a thoughtful teacher, and a fun experience, I highly recommend one of Scott's workshops. Scott Davenport's Oregon Cost Workshop in November of 2017 wast effectively organized, flexible for weather, and the best training I have ever had in 6 days. Scott was very knowledgeable of the area and his accurate read of the weather and tide conditions resulted in maximizing the shooting time. When it rained, we had the ability to have one on one as well as group post processing training. Scott's expert planning to have a lodge for the group opened up a lot of opportunities for the group to discuss photography. The photo presentation by Scott and everyone on the workshop was great. It was great to see how everyone viewed the scene and did their own post processing. Scott also followed up with a private website of everyone's presented photos and a daily itinerary of the shot locations. Thanks Scott for a well organized and planned Photo Workshop. What a great workshop. They say Wonder Woman can dodge raindrops but Scott can dodge whole rainstorms. Several times Scott’s weather apps showed it was raining while we stood in bright sunshine. Scott really knew the places to shoot along the coast. What seemed to be barely a turnoff turned out to be a path to a vista of sand, rock and sea. After a day of shooting Scott was there to help with post processing. His tips and suggestions helped turn a so so photo into a great shot. On the one day that the weather won, Scott showed his post processing prowess with a tutorial using On1 Photo Raw. If you have a chance to attend a Scott Davenport workshop, take it. You will work hard, have fun end up with some great photos. This was my first photo workshop and I can honestly say that when I do my next one they will have big shoes to fill. Completely enjoyed the whole weekend and the format that Scott uses. Good explanations at all locations with tips to get the best shots. Scott also has his camera but if someone needs help it doesn’t come out if the bag. Keeping the group small means lots of 1 on 1 time for everyone. Afternoons are spent processing and we all took valuable lessons away from the workshop. Thank you again for the one on one workshop. I enjoyed your light-hearted manner and that you didn't take yourself too seriously. I've made some headway in the topics we covered, especially working in tandem with the neutral density filters and shooting panoramas. Your explanations were easy to follow, even for me since I'm not a technical person at all. I'm excited to get to work! I'll be sure to let you know next time I'm in your fabulous city!! Scott is great. Communication was thoughtful and informative from start to finish. Emails with suggestions on what to bring, what to wear, and shoot location selection based on date, time and tides. On location, probing questions to determine my skill level and what I hoped to get out of our session. For me, that was learning how to slow down and evaluate the location. The path down to the selected area was slightly challenging for me, Scott made sure I navigated it without issue. My two hour session was over before I knew it. If I am ever fortunate enough to be in San Diego again without question I will schedule another session with Scott. It was such a pleasure to attend this past weekend’s workshop. Starting from your introduction, list of topics, gear suggestions, choosing the best available site for shooting locations according to the weather conditions of the day all the way to employing the approach of what makes a good landscape photo, it was definitely a fantastic experience! Your knowledge, enthusiasm and personable attitude were often present during the training. I attended the workshop with a basic knowledge of landscape photography and you showed me many techniques how to use my camera effectively that will help me take great landscapes. I so much enjoyed your workshop and would recommend it to new and experienced photographers. I have been serious about photography since the early 60’s and you gave me some ideas about how to be more creative that put me on another level. I enjoyed my time on this workshop. Scott was available when I needed him, but he gave me room to run around. I mostly enjoyed the one on one time between the photo shoots and class time. This really gave me the time to pick his brain and get some inside info on how to process some of the pics that I took during the workshop. I plan on taking another workshop and would highly recommend him to anyone wanting to take some great photos of San Diego. I told him that had instructions from my wife to come back with a pic that we could print and showcase in our bedroom and I succeeded. I get to go on more workshops! Scott's workshops are ALL about the participants. Great fun, great locations, gorgeous scenery, and helpful advice, tips and tricks. On top of that, he knows the good restaurants and coffee shops. I came to the San Diego Coastlines workshop hoping to go out and enjoy scenic locations and play with my camera settings and learn things along the way. It was fantastic! The sun didn’t always cooperate, but the shoot, class times, and social times were all worth the trip from Ohio. Scott’s experience and tips really helps make a difference in your photography. I would highly recommend this class to any level of photographer. I really enjoyed my one on one lesson with Scott on coastal seascape photography. Even though I am an experienced photographer, I learned alot of the nuances involved in composing and taking seascape photos that I don't think are covered very well in most books. In my opinion, it's much more difficult than your typical landscape shooting (mountains, waterfalls, woodlands, etc.). The info I received was invaluable and Scott's manner of presentation made it very understandable. He is not only skilled in photograhy and post processing, but also in instruction. I highly recommend taking a lesson from him. You won't be disappointed! Scott is a great instructor! He is very approachable and ensures his student’s needs are met. I really appreciate his level of experience and how he never makes anyone feel uncomfortable by assuming or speaking beyond them. You can learn so much from Scott about technique in the field, post processing, environmental awareness and safety, and much more. I am very happy with the entire experience and the photos I was able to come away with! This was one of the best photo workshops I have attended. Scott was an excellent instructor. He was organized, chose the best locations for the weather conditions, and spent a great deal of his time helping us to master our photos. I have never done any coastal photography so this was a new experience for me. Scott was always available for our questions in the field. 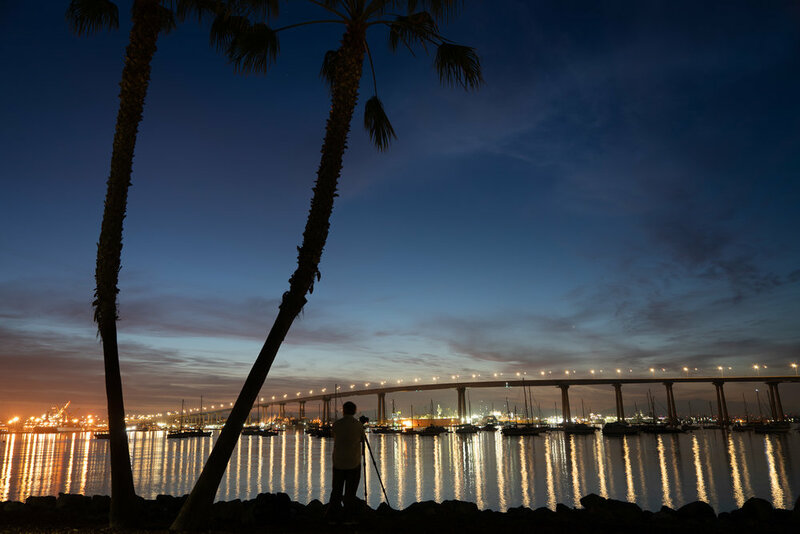 He knew the best locations to capture the sights of the San Diego area. He had organized sessions in the afternoons for lectures, power points, demonstrations, and post processing tutorials all geared to what we were interested in. He listens to his students and provides an experience tailored to our needs. I highly recommend Scott Davenport for his excellent workshops. As a professional portrait photographer when I travel I always have my gear with me and I am interested in what the local photographers are shooting & how to get those iconic shots. I found Scott Davenport on instagram and was hooked. His images are beautiful! Scott let me know what type of gear I needed to bring to our lesson, I learned composition, the understanding of importance of the Ebb and Flow of the water, leading lines, etc. Scott is a great instructor! Scott’s San Diego workshop was a blast! We got out to a variety of different coastal locations that Scott knew intimately for five separate shoots. He advised the best times, locations at each shoot site, suggestions for composition, etc. to get the most out of each shoot. The group was small so everyone could get a lot of individual attention. Experience level of participants varied, but everyone was able to take something new away from the experience. I never felt rushed and was glad to be in the company of other photographers who share a passion for this hobby. Workshop time was useful as well, with plenty of illustrated instruction on how to best use common post-processing software. Highly recommended! Thank you so much for a great private workshop. You asked what I wanted and taught me the skills to make it happen - perfect! 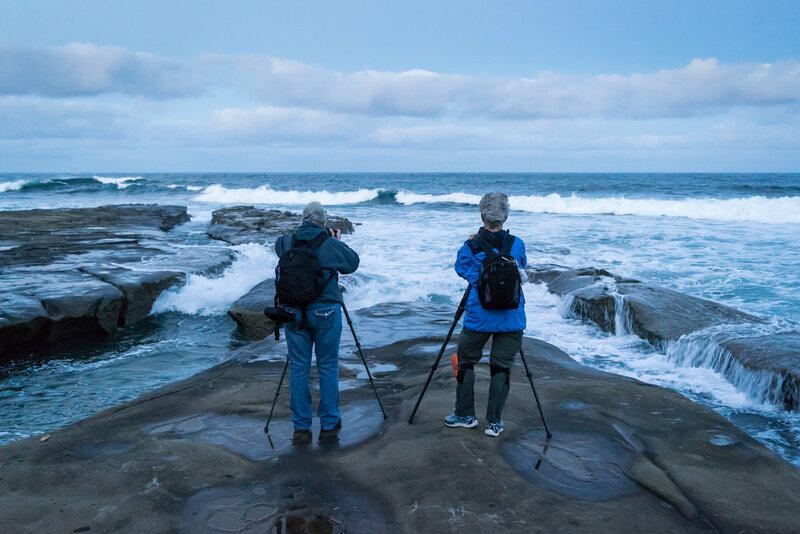 You were spot on for a site in La Jolla, and when you say you like to get your feet wet you weren't kidding - that rogue wave was pretty exciting! You have excellent insight on when and where on the shots. Can't wait to get into a workshop. I enjoy shooting at sunrise and sunset, and appreciate that you were well prepared with tide and weather info and got us to some interesting San Diego coastal locations. I shot some great wave crashes and slow exposure water runs. Fog and clouds didn't always accommodate, but there were alternative shots available to maintain interest. Your grasp of Lightroom and ON1 software was greatly appreciated during the processing sessions. Got to go to the photography workshop last weekend that Scott Davenport put on. Wow it was great. My goal was to take one photo that I could print for a wall photo, Scott helped me get eight or ten to hang. The help with Lightroom was an added plus. Now to practice some of the post processing tricks Scott showed us. This was a terrific experience. Scott showed us places to photograph I never would have gone on my own and gave us specific advice on how to improve both our approach to taking pictures and the pictures themselves. He was very hand-on with each student, and gave patient advice to each student in the field. I was delighted with the images I captured, and in fact one was selected to be shown at the 2016 Del Mar Fair.